Product #21300 | SKU 476927 | 0.0 (no ratings yet) Thanks for your rating! Producing an expansive 180° angle of view, the Canon EF-mount 15mm f/2.8 EX DG Diagonal Fisheye Lens from Sigma offers a super-wide perspective for creative applications. As a diagonal fisheye, this lens produces a notably distorted image that fills the entire frame, and its minimum focusing distance of 15 cm allows for working with unique perspectives with close-up subjects. Additionally, the bright f/2.8 maximum aperture benefits working in difficult and low-light conditions by allowing the use of faster shutter speeds. 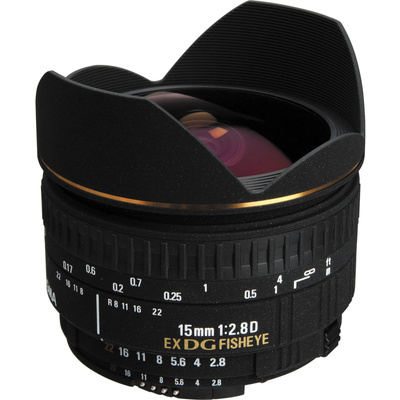 Wide 15mm f/2.8 diagonal fisheye lens is designed for full-frame Canon EF-mount DSLRs, however can also be used with APS-C models where it provides a 24mm equivalent focal length. Bright f/2.8 maximum aperture facilitates working in difficult lighting conditions. Expansive 180° angle of view pairs with the fisheye design to render imagery with distorted, curved lines. As a diagonal fisheye, the image fills the entire rectangular frame. Minimum focusing distance of 15 cm benefits working with close-up subjects and allows for producing highly exaggerated perspectives.